Wilhelm Hess arrived in Cape Breton from West Germany in 1951. 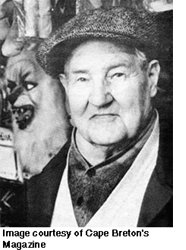 He worked first as a farm labourer and eventually opened a toy store in Inverness. Wilhelm would often exhibit his paintings by nailing them to the outside walls of his shop. He painted images of his memories of his home in Europe and views of Inverness and Cape Breton. He would paint scenes of disasters such as the sinking of the Titanic, the Lusitania and the burning of the dirigible Hindenburg. The Art Gallery of Nova Scotia removed a painting by Wilhelm from the wall of a house in Dunvegan to display in their exhibition "Interior Decorative Painting in Nova Scotia. His work can be found in the permanent collection of the Art Gallery of Nova Scotia, and was included in an exhibit sponsored by the gallery that toured the British Isles in 1989. 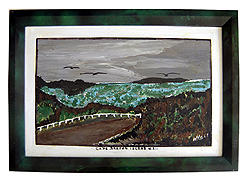 Read the article Paintings by William Hess, Inverness in Cape Breton's Magazine by clicking here.